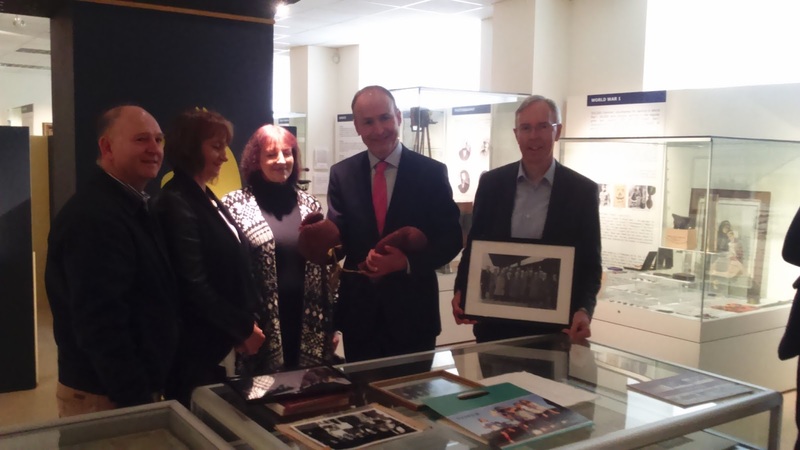 Waterford County Museum: Micheál Martin visits museum. 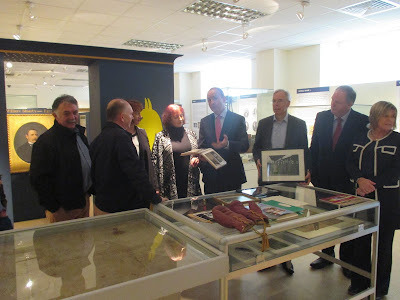 Last Friday, 2nd October, there was an air of excitement and anticipation as the leader of Fianna Fáil, Micheál Martin visited Waterford County Museum. Mr. Martin holding the Golden Gloves. Mr. Martin was born in Turner’s Cross, Cork in 1960, the son of Paddy Martin, formerly of CIE and ex-international boxer and Lana Corbett. He was educated at Scoil Chriost Ri. He later attended UCC and qualified as a secondary school teacher. It was at UCC that he developed a keen interest in politics. He is a member of Dáil Eireann since 1989 and the leader of Fianna Fáil since January 2011. He is married to Mary O’Shea and they live in Ballinlough, Co.Cork. Mr. Martin spent time looking around the museum and was very impressed with the work being carried on. 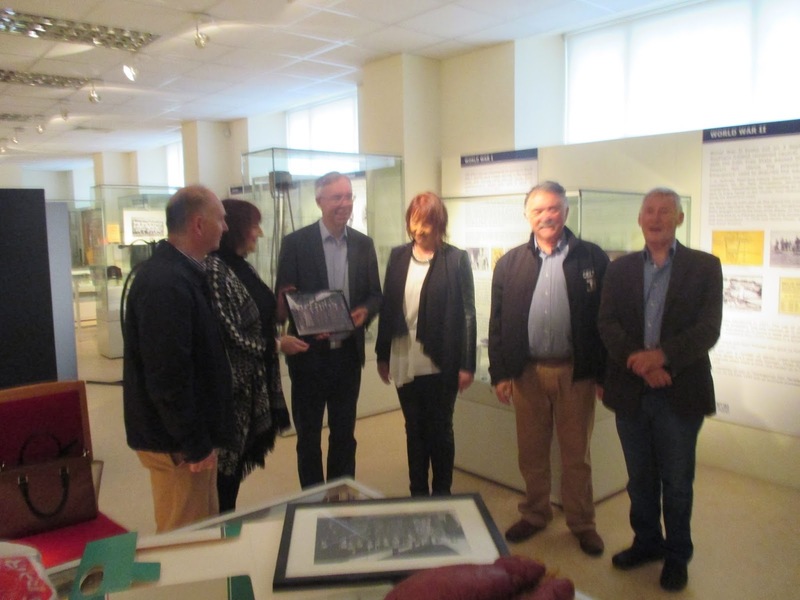 He showed a keen interest in the various exhibits and was excited that the history of the area was being preserved in such a fascinating way. The museum then presented him with a photograph showing his father Paddy with the noted and highly regarded Dungarvan boxer, Peter Crotty. He was delighted to receive it and gave a speech to thank all those present. 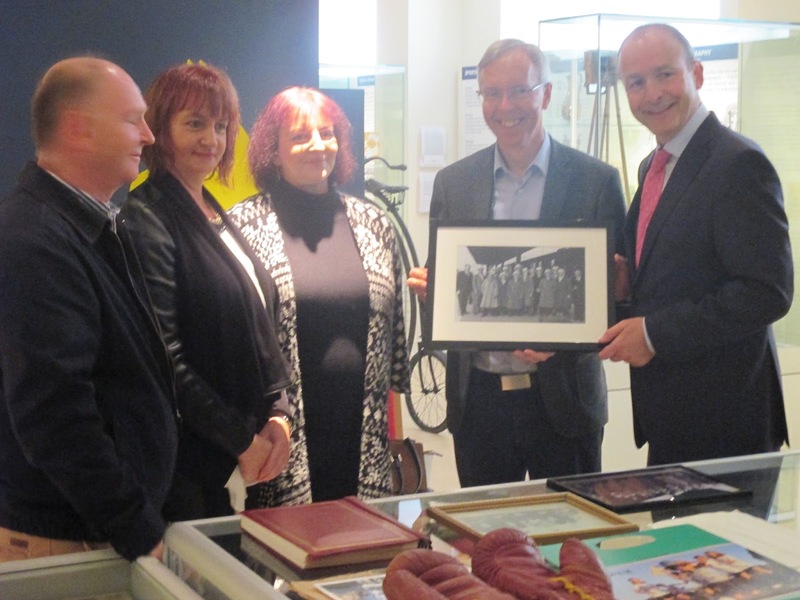 He met the Crotty family who were present and reminisced about the olden days. Also present were Gerry O'Mahony, Dungarvan Boxing Club and Eddie Cantwell, Waterford County Museum. The Crotty family donated Peter Crotty memorabilia, including his golden gloves to the museum, who were delighted to accept them. They will be on display in the museum for future generations to enjoy and cherish. Afterwards Mr. Martin spent time talking to staff and showed a very pleasant temperament and disposition. He answered questions and showed a keen interest in their work. Reminiscing about the olden days with members of the Crotty family. Overall, Mr. Martin enjoyed his visit to Waterford County Museum immensely and vowed to return. It was a very memorable day in the history of the museum.